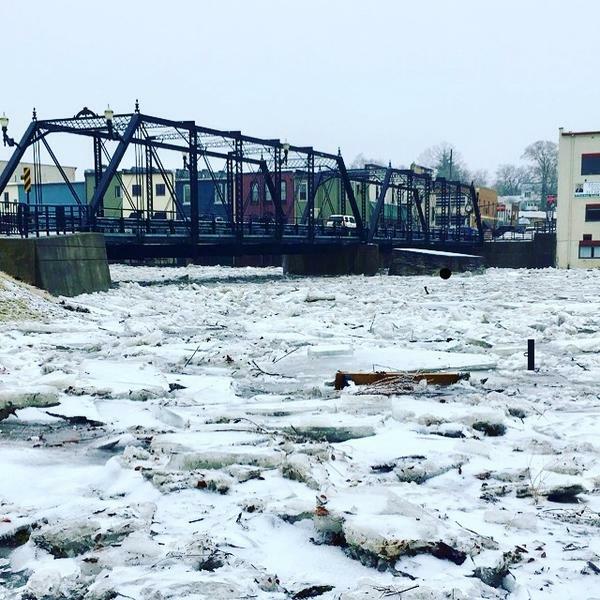 "Unpredictable" ice jams pose threat for even more flooding in Portland, Mich. The Bridge Street Bridge and a frozen Grand River on Wednesday, Feb. 6, 2019. A closed road in Portland, Mich., Friday, Feb. 8, 2019. Jessica Dorsky went to get gas on Friday, but found the station and road were closed. The city of Portland evacuated more residents as severe flooding from the Grand River got worse. The town is about 25 miles northwest of Lansing. 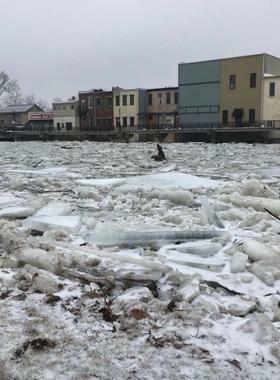 About 50 people were evacuated Tuesday when ice and water began pouring over the banks along North Water Street. 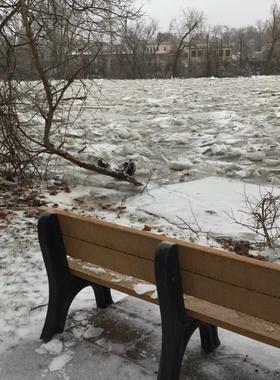 There are ice jams upstream on the Grand River that Portland city officials say could cause flooding, again. Portland City Manager Tutt Gorman says on Saturday he joined the Michigan State Police Aviation Unit and a hydrologist with the National Weather Service for a flyover tour of two additional ice jams up river from the city of Portland. 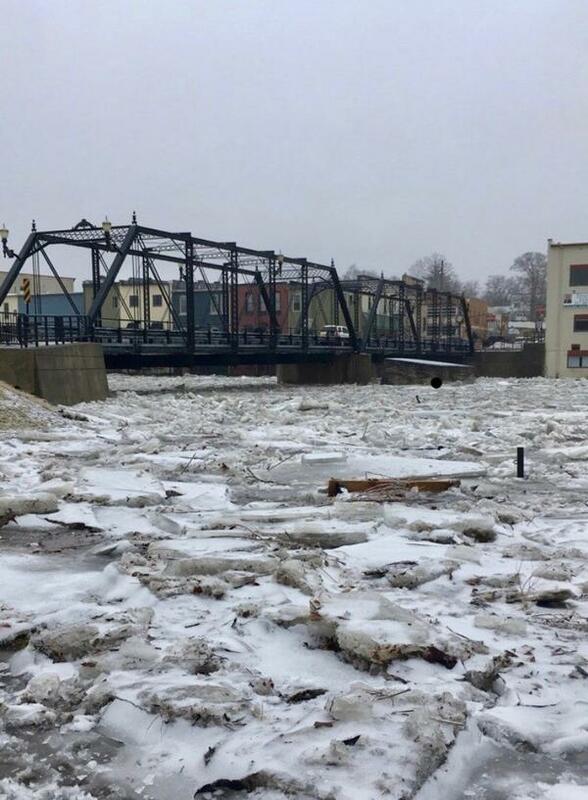 The City of Portland re-opened the Grand River Bridge on Saturday, but in a statement on the city’s Facebook page said the bridge could close again “at a moment's notice” as officials continue to monitor the ice jams upriver. Several other bridges in Portland were closed throughout Saturday. Gorman says most of the people who are evacuated because of the flooding are staying with friends or family members, but he’s not sure when they might be able to come home. He says some homes are still sitting in a significant amount of water. He says some historic buildings in Portland’s downtown were damaged, but overall the damage from the flooding is difficult to assess at this point. Gorman says city and county officials are consulting with state and federal partners about how to address the situation and to secure funding to aid with eventual recovery efforts. The City of Portland is hastily constructing an earthen dam to protect its water treatment plant from the ice and water flooding into it. 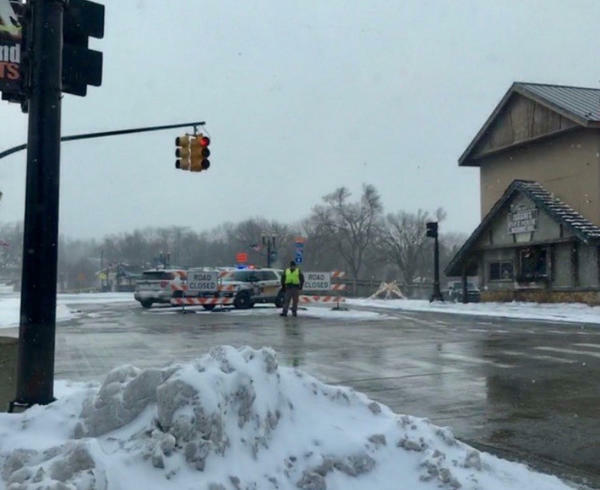 In an update on its Facebook page Saturday morning, the city says the Grand River is currently stable "with minor fluctuations." The city says the Grand River Bridge and other bridges will be re-evaluated Saturday to see if they can be reopened. Charlsie Abel was one of the first to be evacuated. She says everything seemed fine when her family went to bed Tuesday night. "And then right around midnight our dogs kind of started growling and barking," says Abel. "And then we noticed our motion detector lights were coming on, and that's when my husband looked outside and could see water just flowing quite rapidly between our house and our detached garage." Abel says the fire department showed up just as they were grabbing clothes and other necessary items to evacuate. Meanwhile, things weren't that bad for Tim Fuller, who owns five buildings on Kent Street. Not at first. He says the flooding in the basements was well under a foot, until Friday morning, when he looked outside and saw the ice and water moving. He thought it was going to keep going until it moved back into the river. But then it just... stopped. He ran down to the basement of the building he was in. "The water was just pouring in as fast as it could pour, every little crack and seam, bubbling up through the floor," says Fuller. "It rose probably 36 inches in 20 minutes in the basement. So, at that point we knew we were in pretty big trouble." Fuller moved everything he could from his buildings onto the second floor. He says there's nothing more he can do until the water and ice recedes, so he's going to leave town for a few days to try to put the mess out of his mind. Both Abel and Fuller say neither they nor most of the people they know have flood insurance. They didn't see the need for it. City and county emergency officials say the flooding is being caused by ice jams blocking the normal flow of water. The Grand River Avenue bridge, Bridge Street Bridge, and the River Trail Pedestrian Bridge have been closed. The city's wastewater treatment plant was overwhelmed by the volume of water and was forced to discharge some untreated sewage into the river. Power and water service have been shut off to some of the affected neighborhoods.